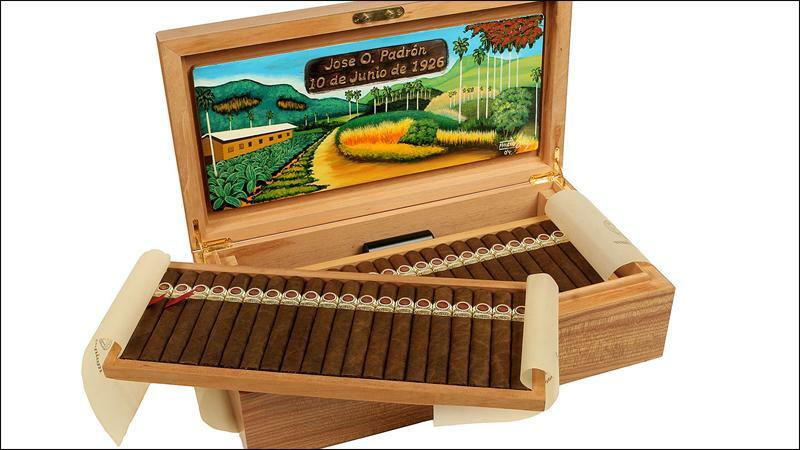 Only 1,000 Padrón 1964 Anniversary Series Millennium humidors were released in the year 2000. The cigars have aged quite well. Call them unicorns, three-dollar bills or Holy Grails, there are many rarified cigars circulating out there that the average cigar smoker will never get the opportunity to try. Some cigars are so rare and mythical that even veteran collectors will go to their graves without ever having seen one in person. Many of these smokes are hidden in private collections or cloistered in aging rooms. Either way, they're beyond difficult to acquire even with a suitcase full of cash. We've assembled a list in no particular order of rarity or importance. Have fun smoking them—in your dreams. Released in 2006 to celebrate Cohiba's 40th anniversary, these humidors cost a bundle eleven years ago. Only a few people got to buy them and even fewer decided to break the box. Stories circulated about supposed "overruns" given as gifts to the rollers who produced these precious stogies. The stories are false. And beware of loose sticks sold online—fakes abound. Unless you saw the Elie Bleu humidor they came from in person and plucked the cigar yourself, provenance is not assured. If you can find a guy who has a box, good luck convincing him to give you one. The late Carlos Fuente Sr. used to make a box-pressed belicoso for himself and occasionally, he'd give some away. They were never released commercially. The blend was slightly altered to accommodate the unorthodox size (box-pressed only half way) and to suit Sr.'s taste. They are absolutely marvelous and have the rare ability to keep an intact ash when smoked well beyond the three-quarter mark. An important note: this is NOT the same cigar as Eye of the Shark, which is a similar size, but a different blend. These cigars were hard enough to acquire when Sr. was alive. Now that he has passed on, they might never be produced again. Back in the halcyon days before the Cuban embargo, the storied "21" Club restaurant in New York City had its own private-label Cuban cigars. These bespoke smokes included Jack and Charlie's "21" Exclusive Havana Selección and Private Stock. They were kept in the "21" Club's humidors and imported into the U.S. by a company called Faber, Coe & Gregg. The "21" Club didn't just have a house brand. Many established brands like Ramon Allones and Por Larrañaga also made special smokes for the New York City restaurant, which is still around today, minus the cigars of course. Cuban Davidoffs are among the most sought-after smokes in the world of vintage Cuban cigars. Now prized by collectors, they were all discontinued in 1991 and every size from the little Chateau Yquem to the larger Dom Perignon commands huge prices at auction. When Swiss retailer Zino Davidoff turned 80 years old in 1986, Cuba created a gigantic cigar called the Davidoff 80 Aniversario. It's almost 9 inches long and was made to commemorate the iconic cigar man and his now precious brand. All Cuban Davidoffs are quite rare, the 80 Aniversario, especially so. As if the Cuban Flor de Cano Short Churchills aren't difficult enough to find, the Diademas are even harder. Funny they're called Diademas, because technically, they're not Diademas at all. They're classic Churchill sized cigars and you rarely ever see them come up at auction. We've rated them in the Connoisseur's Corner section of the magazine and the Diademas have aged very well. Try doing an Internet search of these beauties and you won't come up with very much. The name Dunhill is pure platinum when it comes to the world of vintage Cuban cigars. Outside of the Dunhill proper branded Cuban cigars, there were many lines of Dunhill Seleccion cigars made especially for the London retailer. Among them was Flor del Punto. It has the standard "white rose" band, as do most Dunhill Seleccion cigars—those that are left anyway. If you thought Dunhill Don Candidos and Don Alfredos were hard to find, try locating a Flor del Punto. Let's try and do some speculative math. Only 1,000 of these humidors were created. Each humidor held 100 cigars. That's 100,000 cigars, total. They were released in the year 2000. That was 17 years ago. After nearly two decades, how many of these cigars can be left? Half? Less? Your guess is as good as ours. Intact humidors pop up here and there, and so do loose sticks, but they're mostly in the hands of private collectors. We smoked one of these cigars in our Connoisseur's Corner section of Cigar Aficionado just to see how well they aged. It scored 98 points. Back in 1995, Marvin R. Shanken held a dinner in Paris dubbed the Dinner of the Century. While plenty of great Cuban cigars were passed out, the most exclusive were the special smokes made just for the dinner: the Cohiba Piramides, and the enormous Cohiba "A", a size over 9 inches long. Don't think that subsequent Cohiba Piramide releases were the same blend—they weren't. These were one-time one-offs made for a once-in-a-lifetime event. Six boxes were auctioned off that evening, so there might be a few left somewhere in the world. You probably had no idea this even existed. Until a few years ago, we didn't either. You might have occasionally come across the Fuente Fuente OpusX BBMF cigars. Those are hard enough to find as it is, but an Ashton VSG BBMF? It's out there. The BBMF was created by Carlos "Carlito" Fuente Sr. as an unusually shaped, unusually strong OpusX. It bulges out at the foot like a traditional Salomon but is finished with a strange, mop-top cap at its head—something Fuente impishly refers to as a "Cuban tickler." Fuente, who also produces the Ashton VSG line in the Dominican Republic, rolled some VSGs in this BBMF shape for a charity dinner. It was the first and last time we ever saw them. In case you didn't know, BBMF stands for Big, Bad Mother... You can figure out the rest. Did you know that before Trinidads became commercially available, they were only available as diplomatic gifts from the Cuban government? Unlike today's Trinidad Fundadores, the diplomatic cigars were a little thinner (actually the size of Cohiba Lancero at 7 1/2 inches by 38 ring gauge). According to Habanos, these diplomatic Trinidads were "a brand only reserved for the Cuban Council of State's special gifts." As it turns out, there were a few boxes of these at Cigar Aficionado's Dinner of the Century as well. These Trinidads are so uncommon, they've transcended the world of rare cigars. Now they are cigar legend. Think there are some Holy Grail cigars that should be on this list? Add them to our comments section below.